There's a lot to love about Android, but the slow, fragmented software updates can be annoying. Your friend might be rocking Gingerbread (Android 2.3), but you've been stuck with Éclair (Android 2.1) for months. On the upside, you can do a bit of detective work to see whether your phone is getting the upgrade or not. But a warning: Not all Android phones are getting the upgrade, so you might find out some heartbreaking news. The Android 2.3 upgrade gives your phone an overall boost in speed and battery life as well as a cleaner, spruced-up interface. There's also a better keyboard, easier-to-use copy/paste function and an improved camera user interface. Google is rumored to be working on the follow-up release, Android 2.4, which could make an appearance at next month's Google I/O conference. My colleague at Computerworld, JR Raphael, put together a comprehensive list last week of which phones are confirmed or rumored to get the update and when. He also dug up which phones will be reaching their end-of-update lifecycles. ReadWriteWeb made it even easier to track your phone by putting together an open Google Spreadsheet of JR's list. From looking at JR's list, it is pretty obvious that the phones getting upgrades came out in the last year or so. Furthermore, most of these phones have received 2.2 updates in the last few months. So if your rocking a 2+ year Android phone that's still running Android 2.1, you'll probably be left out of the Gingerbread goodness. HTC also confirmed this with us when we met with its product managers last week. 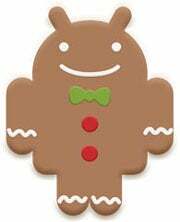 They told us that pretty much every phone that has been upgraded to 2.2 will get the Gingerbread update.